Dr. John Henry Irons once worked as a ballistics engineer until seeing how his technology was used for weapons in Qurac. He began working as a construction worker named Henry Johnson who Superman once saved from falling to his death. 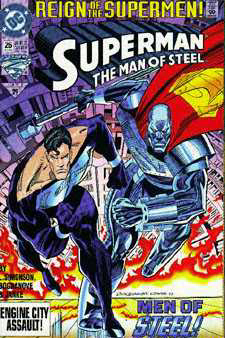 After Doomsday apparently killed Superman, Irons was inspired to use his engineering skills to forge a suit of armor and adopted the identity of Steel, when he saw local gangs using guns based on the technology he invented. Although originally working in Metropolis, Irons moved to Washington D.C. Later, Irons discovered he's a metahuman and began using armor he can summon. Recently, Irons publicly revealed he is Steel. Irons' adventures appeared in the comic book series Steel. For awhile he was a member of the JLA and then returned (with his neice) to live in Metropolis where he helped the SCU. John Henry, working from his Steelworks, has aided Superman in learning more about the workings of his new Fortress of Solitude and its connection to the Phantom Zone. With the help of Professor Hamilton, John Henry was able to send Superman (and Lois Lane) back to Krypton via a connection established through the Phantom Zone (SUP #167). John Henry was taken prison, having been arrested by government agents because of his connection to an underground movement trying to wrest control of the B13 technology away from Lex Luthor (MOS #112). Luthor later called on Steel to join the newly formed Suicide Squad in going to the moon to release Doomsday from his lunar prison in a plan to set the creature on Imperiex (AOS #594). The team don't fair well however, and Steel breaths his last breath as Superman arrives on the moon. But Superman isn't prepared to let Steel die, and confronts the Black Racer (who has come to take Steel's soul)... this confrontation appeared to have some affect on the Black Racer, who decided to allow Steel to live. Finding himself being offered the Entropy Aegis armor by Darkseid, John Henry Irons appears in space just in time to offer Superman help in trying to stop Brainiac 13 from taking over the universe (MOS #117). After defeating both Imperiex and Brainiac 13, John Henry Irons and Superman conducted tests on the Entropy Aegis to guage its full power, enabling Steel to appear in Superman's defence when he was abducted from time and space by the Linear Men to stand judgement over his involvement in stopping Imperiex (MOS #118). When the time was right, Darkseid utilized the armor to brainwash John Henry and bring him to Apokolips - to serve Darkseid himself. Ultimately, Superman, Superboy and Supergirl rescued John Henry and returned him to Earth. Medical tests concluded that Irons was severely injured internally, meaning he could no longer assume his role as Steel (Superman Versus Darkseid: Apokolips Now!). The niece of John Henry Irons, Natasha is no stranger to superheroics. When her family was kidnapped, she personally joined Steel in rescuing them. When Steel joined the JLA, Natasha and a friend of hers already discovered the transporter and were touring the Watchtower. Over time, Natasha Irons has proven she is a brilliant and courageous young woman. However, events turned grim when Steel was seemingly killed in combat. In fact, John Henry was badly wounded and used an advanced suit of armor called Aegis in order to return to action. The Aegis armor was actually a product of the planet Apokolips, home of the villain Darkseid. When the time was right, Darkseid utilized the armor to brainwash John Henry and bring him to the vile planet - to serve Darkseid himself. Ultimately, Superman, Superboy and Supergirl rescued John Henry and returned him to Earth. Medical tests concluded that Irons was severely injured internally, meaning he could no longer assume his role as Steel (Superman Versus Darkseid: Apokolips Now!). Ever the hero, and taking the reins from her uncle, Natasha Irons is the new Steel. Recently, she joined Supergirl and Girl 13 in saving Metropolis (ACT #807-808). As Steel, she also joined members of the Superman and Batman Families as they invaded the White House and battled Lex Luthor (Superman/Batman #5). Wearing a personalized suit of armor, the latest Steel possesses super strength, the ability to fly via jet boots, and other enhanced physical powers thanks to advanced technology. Natasha also uses a modified version of Steel's hammer.